Cindy Fassler, our VP & Chief Talent Officer, has been working as a professional recruiter for 30 years. This has enabled her to garner experience and knowledge necessary to coach others in their hunt for a job. Job hunting and interviewing can be daunting and exhausting. 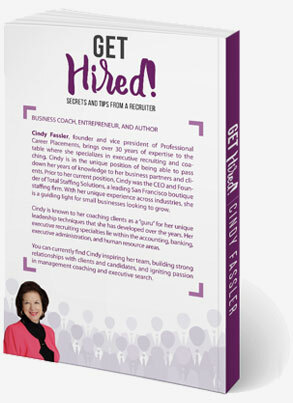 Cindy will share her hiring process tips and tricks to boost your confidence and interviewing skills to increase your chance of receiving a job offer. Cindy was a great help for me finding a new job. She has several contacts around the bay area, and clearly saw value in my resume. Cindy worked with me, interviewed me, and coached me through the entire process. She found interested companies for someone with my skills, submitted my resume, scheduled the interviews, coached me through the interview process, followed up after each of the interviews, gave status updates to me all along the process. She was very happy when a job offer was extended, which I accepted. She still checks in even after I have been with the company. I have already recommended Cindy to people I know. If you are looking for someone to work hard for you and help you through the job hunting and interviewing process, Cindy is GREAT!!!! She will be the first person I contact if I am looking for another job. Finding a job is hard work! Get Hired! has the answers you have been looking for! Get Hired! has the secrets and tips from A to Z on the interviewing process! Learn how to land your next job! 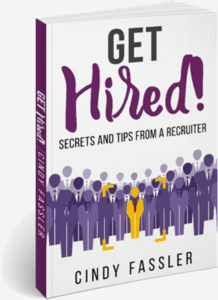 • Use this guide to get hired now! You landed a job interview—congratulations! This is one of the most critical steps in getting your dream job. The interview is your chance to wow your potential employer and show them that you are the person for the job. So, how do you go about doing that? Follow my unique interview prep method that has landed thousands of job seekers their dream job! The purpose of this guide is to help you get ready for the most important part of your job search: the interview. If you have an upcoming interview, or if you’re just starting the search and looking to get a leg up on the competition, this guide is meant to give you insights into what recruiters and hiring managers are looking for and how to prepare. I will take you through every part of the interview process, from a prequalifying phone screen to an in-person interview with the hiring manager.